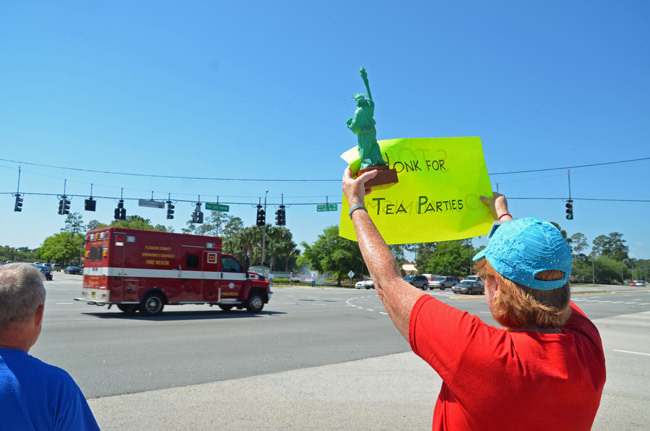 In light of November 2012’s electoral setbacks, some are ready to write off the “tea party” as a movement whose time has come and gone, but don’t tell that to Florida’s grassroots activists. Hi Governor Scott, It’s Me, an Early Tea Party Supporter. Not That Much Anymore. It’s difficult to gauge something like a “tea party agenda,” because, as reported previously, the movement remains largely ill-defined and amorphous, with different ideological and political interests attaching themselves to it when convenient. But if the tea party is defined as a broad grassroots commitment to limited government, less taxes, and free markets, and the legislative realization of these principles, there’s probably no better de facto representative of the movement in Florida than AFP, whose “Five for Florida” agenda has been endorsed, not only by nearly two dozen lawmakers and state Chief Financial Officer Jeff Atwater, but also by several organizations around the state that identify with the tea party label. Mike Hill, president of the Northwest Florida Tea Party, sits on the board of the nonpartisan government watchdog Integrity Florida, which has come under fire over the last week for teaming with AFP to produce a report highly critical of Enterprise Florida, the state’s program for incentivizing businesses to set up shop in the Sunshine State. Hill declined to elaborate on specific legislative proposals his tea party organization would be getting behind in the coming session, but he did share his impressions of what he thought were the top concerns of Floridians who identify with the tea party movement: gun rights, Obamacare, and government transparency. “The tea party believes strongly in our Constitution, which means the Second Amendment gives us the right to keep and bear arms; that’s going to be a big issue for us,” Hill said, referring to efforts by some legislative Democrats to amend or revoke the state’s “stand your ground” laws. Since the Patient Protection and Affordable Care Act has been declared constitutional by the U.S. Supreme Court, Hill says tea partiers’ next target is the prospect of state-based health insurance exchanges. One area he thinks tea partiers can ally with liberals and moderates is on the issue of government transparency, particularly with regard to the expenditure of campaign monies. “That’s something we think can be done very easily and quickly,” he says, while praising proposals already put forward by House Speaker Will Weatherford and Senate President Don Gaetz. Some of these same concerns were echoed by O’Brien and Abigail MacIver, AFP’s director of policy and external affairs. But they were much more specific about what legislation they’re backing. — Reform taxes and end corporate welfare. — Don’t make financial promises taxpayers can’t keep. — Be stewards of good, transparent government. — Empower kids with the best education. — Free entrepreneurs to pursue the American dream. 1. “Parent trigger” legislation, which would allow parents of public school children to convert their failing schools to charter schools. 2. House Speaker Weatherford’s pension reform legislation, which would place new state hirees on 401(k) style pension plans. 3. Freshman Rep. Neil Combee’s HB 121 (“Department of Economic Opportunity”), which would require local governments to submit a list of all local fees and tax rates, along with the length of time required to obtain certain business licenses and permits, and for this information to be published on the website of the Florida Department of Economic Opportunity. 4. A bill recently introduced by the House Education Choice and Innovation Subcommittee, which requires greater transparency on the part of charter schools and makes it easier for successful charters to expand. 5. Legislation backed by Senate Banking and Insurance Committee chairman David Simmons which would assist in the progressive depopulation of Floridians from Citizens Property Insurance, the state’s taxpayer-subsidized program for homeowners who cannot afford to purchase property insurance from private providers. 6. Legislation expected to be introduced under the patronage of Speaker Weatherford, which would expand virtual learning opportunities for Florida’s public college and university students. It’s hard to take Mr. Hill’s position on the ACA seriously when he thinks that Medicare is taking up 25% of the state budget. I think proposals in #1, 2, 3, 4 and 6 should be discussed in an open forum. The country is on a trend to destroy itself financially and culturally from within. Nothing has changed for years to stop the decline. Everyone complains but no one does anything to stop the carnage. 11 thousand new people file for food stamps everyday now. That will add another 4 million to the rolls by the end of the year. We used to create that many jobs that payed enough to support ourselves. Americans in general have become so stupid and so dependent that nothing will change until the country is totally destroyed. This data shows Florida lagging behind USA averages in some critical areas. Does anyone really think that individual companies would have stopped poluting on their own? Please, does any reasonable person really believe that with less regulation companies would NOT continue to maximize profits by cutting corners on the quality of our environment and work place when ever and where ever possible? A successful Tea Party rally is one where the signs have correct spelling. Other than that, the electorate has realized just what the Teabaggers really are – slef-centered whiners!